The North Sea oil industry has formed a critical part of Scottish economy, politics, and culture since the first oil was ceremonially brought ashore in 1975. Massive metal platforms are scattered throughout the North Sea, dedicated to raising that finite material that is embedded in our day-to-day life. Almost half a century later, many of these mammoth structures are nearing the end of their lives. Decommissioning will be a challenging exercise that will play an increasingly prominent role in Scottish industry. It is also one that offers unique collecting opportunities to museums. 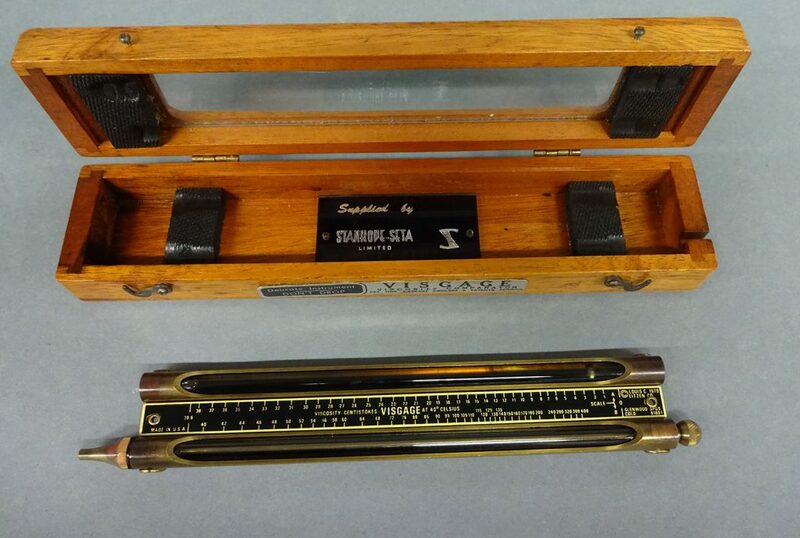 National Museums Scotland has always collected contemporary technology. The ongoing and future removal of oil rigs will, of course, have a profound economic, political and cultural impact. This is precisely why we collect objects and their embodied stories, from this, and other, modern industries. By collecting contemporary science and technology we document important events as they happen, and consequently, create a legacy for future generations. This approach is valuable as we can rescue objects that may not typically be considered ‘museum worthy’ by potential donors. 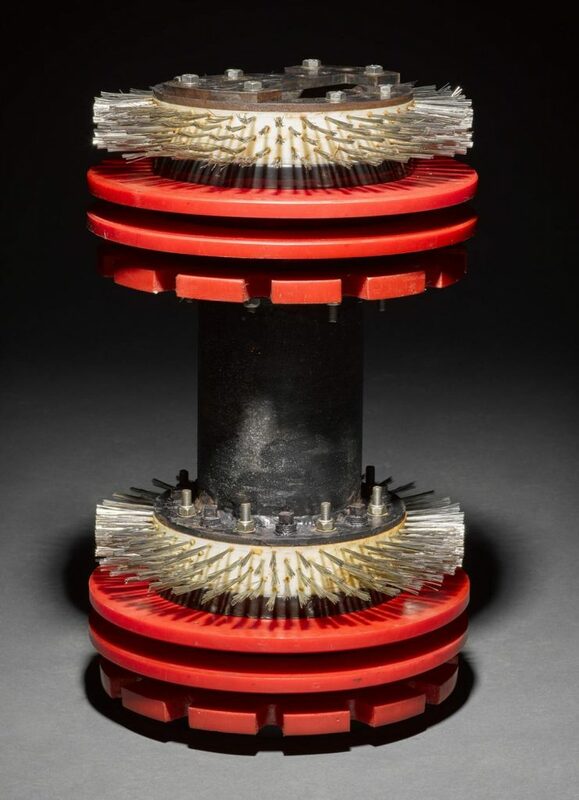 An example of ‘rescue collecting’ in action is this viscosity comparator – an elegant instrument previously used to analyse oil samples extracted from Murchison Platform. Visual artist Sue Jane Taylor, whose work is currently on display in the Age of Oil exhibition at the National Museum of Scotland, recovered this object from a recycling skip. She was then able to donate it to National Museums Scotland, with the blessing of Murchison’s Offshore Installation Manager. T.2017.11.1 Viscosity comparator in box, used to measure the fluidity of oil, part of the laboratory equipment used on the Murchison platform, by Louis C. Eitzen Company, USA, c. 1979. Yet contemporary collecting, particularly in regard to big industries, is not without its challenges. The vast scale of these installations and the equipment within mean that storing, conserving and displaying the objects will be difficult. As such we make informed decisions about representative objects that we can appropriately bring into the national collection. Moreover, curators must assess the scientific, technological and social significance of these objects without the benefit of hindsight, and indeed often without viewing them first-hand. Why collect the oil industry? 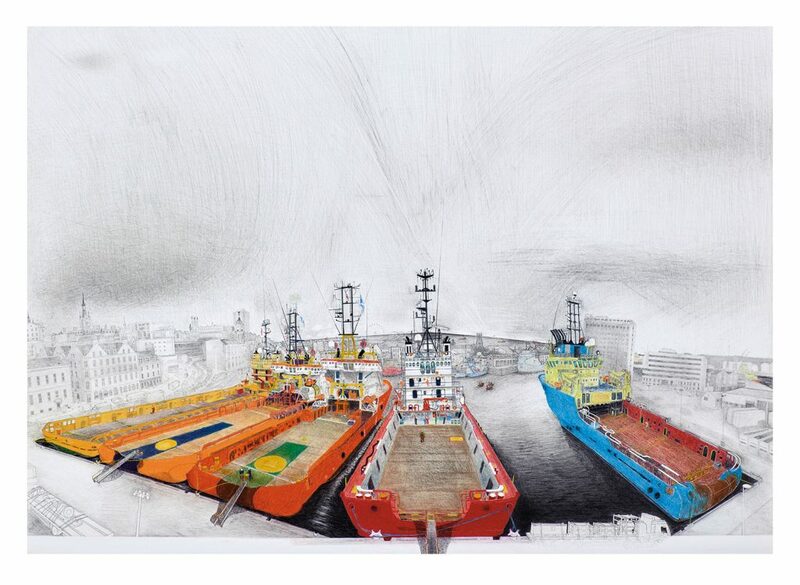 View from Market Street, Aberdeen Harbour, 2015, mixed media on paper, 1000mm x 700mm © Sue Jane Taylor. Photographer: Ewen Weatherspoon. Decommissioning is a daunting project that will be expensive and challenging and has notable effects both within and outwith the energy sector. The City of Aberdeen is closely entwined with the North Sea oil industry, with fluctuations in the price of oil often mapping out onto the city’s economy. Oil rig workers may also find their jobs and livelihoods at risk as platforms shut down. There is a critical political poignancy to the topic. From the discovery of North Sea oil in the 1960s, the fossil fuel has found itself on the political battleground, perhaps most famously in the 1970s campaign for Scottish independence, and again in the more recent one in 2014. This may continue for some time, but owing to the vast exercise of decommissioning this will also become a more frequent topic of discussion. 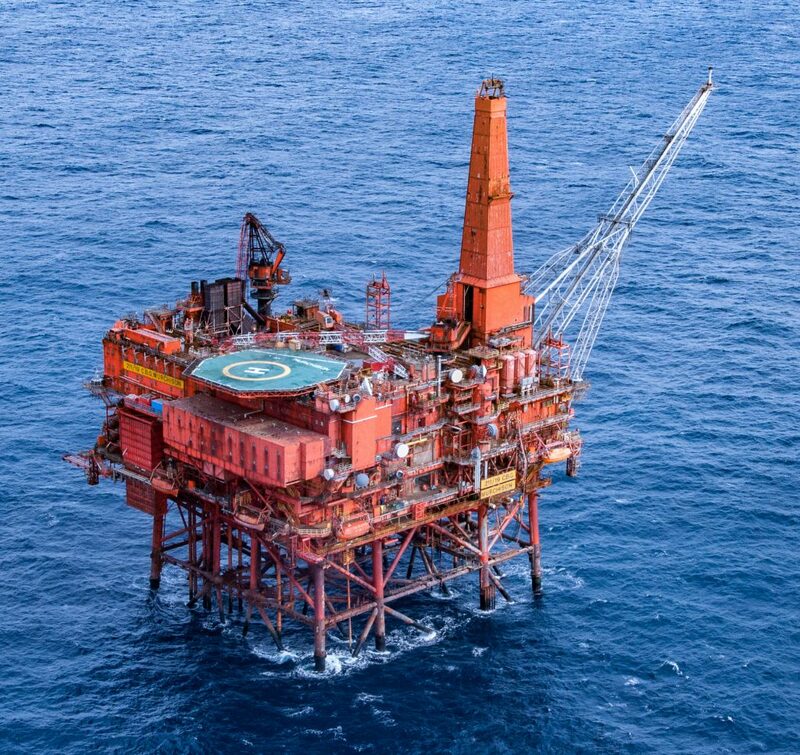 One of the first North Sea platforms to be removed was Murchison Platform, operated by Canadian Natural Resources International (U.K.) Limited and located 240 kilometres north east of Shetland. It ceased production in 2014 after 34 active years, an event which is documented on video by Sue Jane Taylor, and can be viewed in Age of Oil. The 24,000 tonne top-side has been dismantled and brought ashore, and the remaining structures that anchored the top-side to the seabed will begin to be removed in 2017. The Murchison platform © CNR International (U.K.) Limited. CNRI has donated several items to National Museums Scotland, which help to capture the remote and almost-alien environment in which many are employed. The equipment employed is often large and sturdy, putting efficacy over glamour. T.2015.111 ‘Pipeline pig’, Canadian Natural Resources International (U.K.) Limited, 2014. In collecting artefacts we can get a real sense of the people that work in the industry. We try, where possible, to acquire personal stories – whether in the form of anecdotes or a general sentiment – alongside objects. A human dimension becomes prominent in these large structures through items like this affectionately-named ‘tea-flower’ (pictured below). Teacup Carrying Device used on Brent Delta platform, UK, 2017, on loan from Shell UK Limited. This homemade device was made from spare material and was used to enable one person to carry up to six cups of tea to their colleagues. 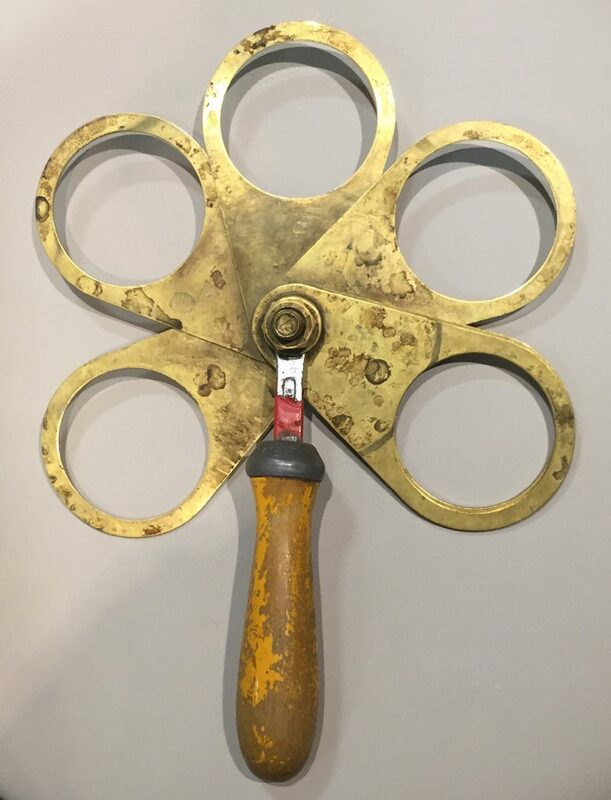 The drillers’ telephone comes complete with a list of extension numbers, and we can tell which numbers have been dialled most frequently from the resulting wear on the buttons. 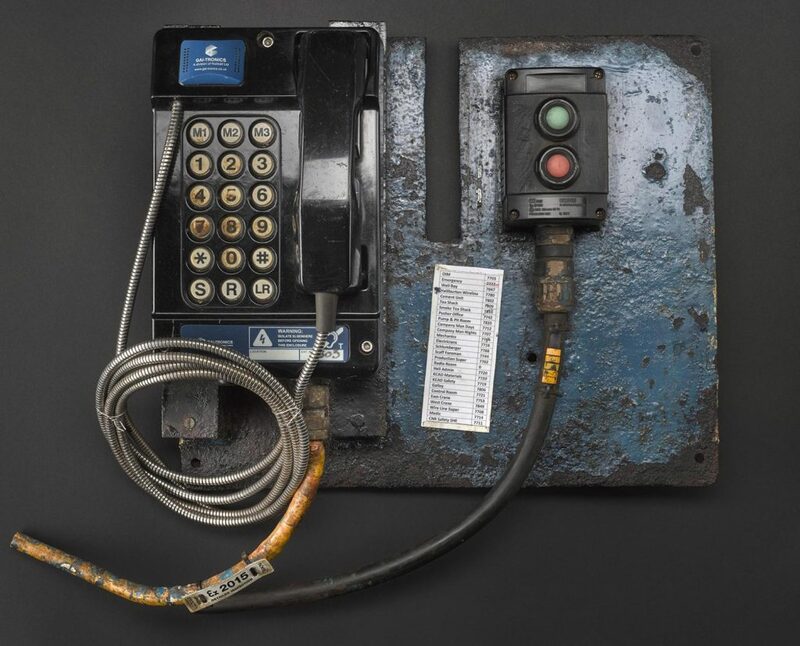 T.2016.80 Driller’s telephone used on Murchison Platform, UK, c.1979-2015. As oil platforms are removed, equipment for renewable energy sources becomes increasingly prominent. It was recently announced that Scotland’s largest solar farm will soon be built in Elgin, and will hold 55, 000 solar panels that could provide energy for over 3,000 homes. Wind farms, both onshore and offshore, help the UK to increase the percentage of energy provided by clean sources. It is also the case that wave-power is a promising source for electricity generation. National Museums Scotland has a long-running schools’ programme Get Energised, funded by the Scottish Power Foundation. 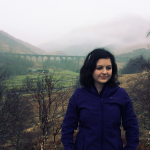 Get Energised facilitates science, engineering and technology engagement through a focus on Scotland’s future energy needs, focussing on renewable energy. 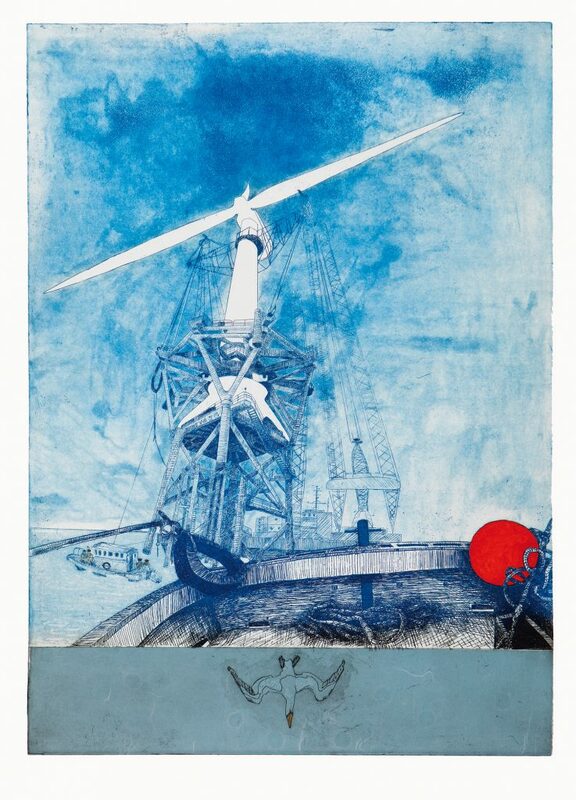 Beatrice Works Suite No 7 – Assembly offshore, Moray Firth, 2012, edition 20, colour etching, chine collé and hand watercolour, 420mm x 300mm © Sue Jane Taylor. Photographer: Fin Macrae. On 22 April 2017, the UK had its first coal-free day since the 1880s. On 7 June 2017 national grid data showed that wind turbines and solar panels helped the UK to have over 50% of its energy generated by renewable sources. The use of renewable energy is a particularly exciting and promising industry, and National Museums is collecting pertinent artefacts to capture this moment in time. The Age of Oil exhibition is on display at the National Museum of Scotland until 5 November 2017. This is a free, multi-media exhibition that brings a unique perspective to the relationship between art, environment and industry while revealing an alien way of life on board a North Sea oil platform. This exhibition showcases the work of visual artist Sue Jane Taylor who has worked in some of the most remote and challenging environments in Scotland. An Age of Oil publication featuring Sue Jane Taylor’s works and diary extracts is available to buy here.